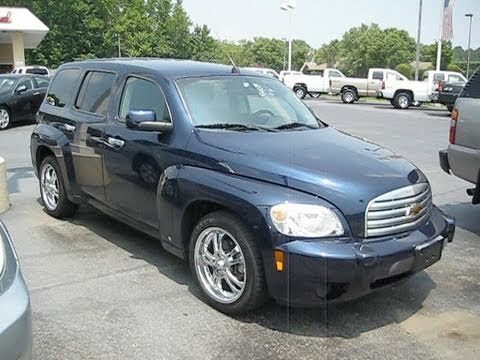 If you like your retro style backed with substance, the functional, comfortable and eager 2009 Chevrolet HHR will satisfy you beyond its intriguing looks. My 09 Chevy hh are safe spacious and even has a nifty little compartment. My 09 Chevrolet hhr has plenty of room, seating 5 people, including the driver. The backseat is very spacious. I have plenty of room for even bigger people. I really enjoyed all the safety features it has including many airbags and I love the digital panel that allows me to see how many miles per gallon I average as well as how many gallons I have left in miles. I do wish the center consul was a little bigger and wasn't so such tight squeeze for my coffee. The trunk although it is a hatchback is very spacious and even has a shelf that you can stack up for even more space. I do not like that it does not have anything to secure any of the stuff in the trunk, and it is a plastic lining so things are constantly sliding around back there. Doing home oil changes are very easy to do as well as much other car maintenance that you would do at home rather than have a shop and there is plenty of space under the hood to work. There is also this awesome hitting compartment in the front that allows you to store stuff away not in the glove compartment. My car was bought used in came with a remote start which is been very convenient during the winter months in Massachusetts state. I feel very safe when driving this vehicle and I enjoy how safe I feel my son is as well. I have not had any major issues with my car and it has served its purpose with many years left still ago. I like my HHR. I would like to have a newer model. We have not had any major work done. However, there in something wrong with the computer that is not being fixed. The radio goes from low volume to high by itself. The light for that area goes off and on. The ESC light is often on. Service engine light comes on even though it has been serviced. I really like the ease for me to drive. The seats are comfortable for me...a smaller older lady. This is the only car that I not my husband picked out and I really like it. Her. The vehicle is easy for me to drive. The radio does not work. Even when replaced. I think this is a computer problem but it is never fixed during service and oil change. I like the performance. It does not slow down when on cruise and you hit a hill. I like the heated seats in front. It has a good take off speed. I do not like it because the computer warns of things that are not happening. Clock lights only work part of the time. The radio volume will go loud by itself.